Well, the move is underway and I am incredibly busy with packing our house and preparing for our Home Gallery Show. The show will be held on Friday, September 19th and 20th from 9 AM - 6 PM. For more information visit my website by clicking here. There are over a dozen artists with lots of beautiful artwork. 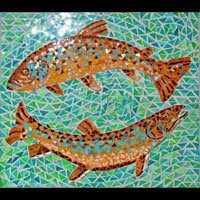 The image of glass mosaic at left is just one example of the artwork that will be displayed. Due to our move to Melbourne, Florida, I am having a huge sale of my artwork at the Home Show. If you are in the area this would be wonderful time to get a great deal on a limited edition print or watercolor original. Our move is the week after the show, so I have been a little too busy to paint lately. As we settle into our new home in Melbourne, I am sure I will begin working again and it will be fun to see how my new environment affects my work. Hope to see you at the Home Show!! !